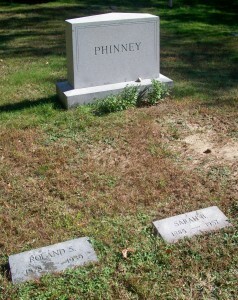 Ancestry: Levi Lincoln Phinney; Levi Phinney; Levi Phinney; Isaac Phinney; Thomas Phinney; John Phinney; John Phinney; John Phinney, Dea. Born: December 18, 1878 in Sandwich Ma. 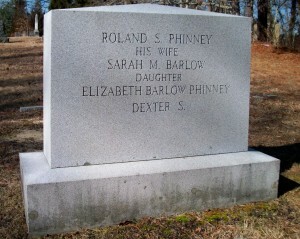 Died: June 9, 1939 in Bourne Ma. at 60 yrs, 5 mos, 23 d.
Where Lived: 393 Barlows Landing Rd. in Pocasset Ma. 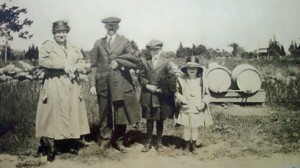 Married: April 21, 1908 in Brooklyn N.Y.
1. Dexter Sumner Phinney; (December 16, 1910 – April 30, 1956); Married Winifred Abbott Jordan (1911 -2006) (Allan Jordan & Gladys Ransden) in Bourne Ma. on June 14, 1932; Winifred married (2) Bartolomeo Rigazio (1909 – 1976) (Giovanni Rigazio & Bollea Rosa Boffea) in Guilford N.H. on May 20, 1972; Dexter & Winifred were both members of Bourne High School Class of 1929; Dexter is buried with his parents, sister & daughter Alynn in Pocasset Cemetery. 2. Elizabeth Barlow Phinney; (December 3, 1912 – November 15, 1999); She was Postmaster at Pocasset & a member of Bourne High School Class of 1931; Elizabeth was unmarried & is buried with her parents & brother Dexter in Pocasset Cemetery.